Executive remuneration was a hot topic for investors during 2018, according the ASIC Annual General Meeting season 2018 report. The Australian Securities & Investments Commission notes the number of remuneration strikes at corporate Annual General Meetings rose to 12 in 2018, compared with five in 2017. ASIC sheets the results back to the Royal Commission into Misconduct in the Banking, Superannuation and Financial Services Industry; high levels of remuneration – including performance based payments (or the lack of links between performance and payment); and concerns about the structure of plans, particularly those including incentives or those that were overly complex and opaque. Some strikes were related to executive conduct as revealed in the Royal Commission. Not surprisingly, ‘for’ votes in the banking sector fell sharply to 66% in 2018 from about 96% in 2017. National Australia Bank’s remuneration report recorded a first strike ‘against’ vote of 88% – the highest first strike recorded for an ASX200 company since the remuneration series began. The Royal Commission catapulted issues such as social licence to operate and community and community expectations into the spotlight and companies directly involved in the Royal Commission received the lion’s share of shareholder angst. Environmental, social and governance issues also proved a hot topic, ASIC claiming that sustainability and climate change dominated the ESG agenda, with a some attention also directed to human rights issues. It also noted that ESG received broader shareholder support in 2018, suggesting it may gain further traction in 2019. Non-renewable energy companies received the bulk of the ESG focus. “We consider that these results are indicative of broader shareholder focus on the issue of climate change – which, in our view, appears to be increasingly a ‘mainstream’ reporting and disclosure issue for ASX200 companies,” ASIC said in its report, directing readers attention to Report 593 Climate risk disclosure by Australia’s listed companies. ASIC said shareholders requisitioned ESG resolutions in four ASX200 companies during the year, down from six in 2017, but the shareholder support for those resolutions jumped sharply to 19% in 2018 form 6% in 2017. One example was a resolution proposing Origin Energy’s board commission a review of the public advocacy positions on climate change adopted by the associations of which Origin was a member, and received 46% of favourable proxy votes, was not put to the floor because it was conditional on the passage of a non-approved constitutional amendment. 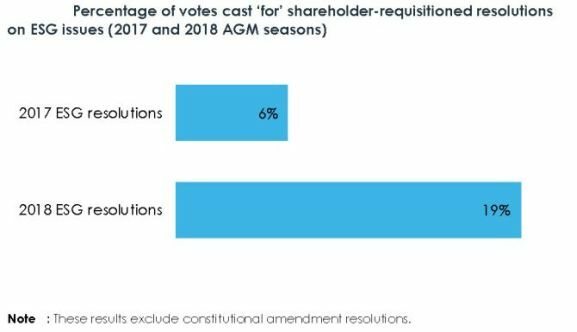 Shareholders also registered protest votes against director elections and re-elections and these often coincided with ‘against’ remuneration votes. As observers at the meetings, ASIC noted a higher level of shareholder engagement, with many voicing disapproval and quizzing directors. There were some concerns voiced that directors were taking on too many board appointments. 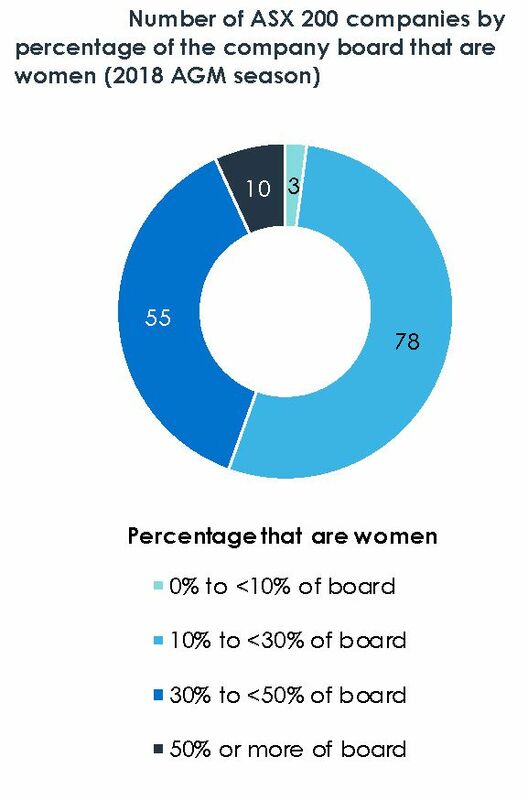 Board gender diversity on boards continued to improve, the number of women on boards rising to 30% on ASX 100 companies and 29% on ASX200 board companies, compared with 22% of board members in the ASX All Ordinaries Index. Meanwhile, Macquarie Wealth Management points out that Royal Commission into the banking industry had a few things to say about remuneration as well. In particular, the commission recommended that management of non-financial risks – particularly misconduct — needed to form a greater part of remuneration and calls on APRA to review standards with this in mind and calls for the design of a system that encourages a focus on long-term financial soundness. The report also recommends the claw-back of vested remuneration in some instances. However, it does not recommend public disclosure of any remuneration changes struck on this basis. It also recommended setting limits on the use of financial metrics relating to long-term variable remuneration – long-term incentives (LTIs). It also noticed a focus of LTIs on annual metrics such as Return on Investment (RoE) and Total Shareholder Return (TSR), rather than long-term financial performance. Macquarie says internationally, APRA is seeing a shift away from financial metrics towards non-financial metrics.